Polyurethane is petroleum based synthetic plastic, which is available in many grades. These range from low quality materials such as those used in industrial applications; through to the Ultra high performance Polyurethane we use in our suspension bushings. In most cases there is a bushing to suit the task or we have the ability to create a bushing using our years of experience and intricate design features for your specific application. We are aware of the need for our customers to service their customers until a quality bushing can be acquired to provide a suitable long-term solution. Urethane bushing material is available in a range of sizes to suite your requirements from 25mm OD x 300mm long to 150mm OD x 300mm long which can be turned to give a short term solution. Other uses can be for industrial applications. The tool listed below is for average size single-phase lathes suitable for general workshop use. 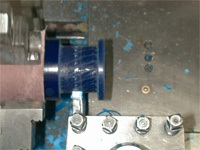 The tooling may be purchased at most major engineering outlets. There are many types of grades of high-speed steel ranging from hard to grind high wear resistant, to the soft easy to grind but will wear easier. For general workshop use we have suggested TECMAX (silver) as it can be ground easily using a general workshop-grinding wheel. Ultramax (dark gold) Tool bits are made from M IOOA - molybdenum-cobalt-vanadium type high-speed steel, which possesses a very high 'red hardness". Both the cobalt and vanadium content is higher than the M2 or M42 materials, making the Ultramax Tool bit extremely resistant to the heat of cutting and to abrasive wear. Ultramax Tool bits are recommended for production turning or machining the most difficult to machine materials. Available in square - imperial sizes. Supermax Tool bits are made from M42 - tungsten-molybdenum-cobalt type high speed steel and possess greatly increased resistance to abrasion and a very hard "red hardness" or 'hot hardness'. They are therefore able to withstand high cutting speeds and are specially suited to production turning or machining of high alloy steels. TECMAX (silver) are made from M2 - tungsten-molybdenum type high-speed steel, giving them greater toughness and resistance. They are most suitable for turning or machining low alloy and free machining steels and most non-ferrous materials. Available in square ­imperial sizes, round - imperial and metric sizes. Holder for parting tool. Tool bit size. Note: This may change to suit different machines. 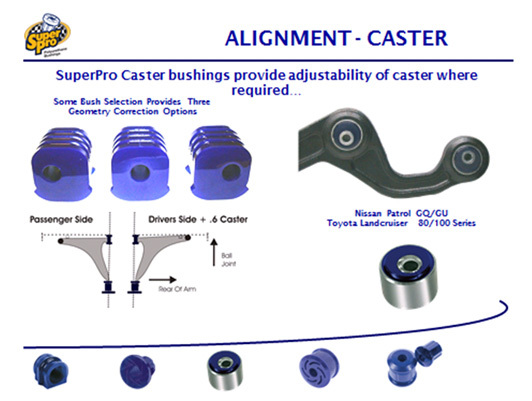 These are a guide only and may vary depending on tool design, temperature and holding methods. Drilling speed is 50% of turning speed. The most common method of sharpening is to use a bench grinder with a rough wheel to give the initial shape and then a fine stone to give the required finish. When grinding square tool bits it is recommended that they are kept as cool as possible to protect the integrity of the tool bits. This can be achieved through continually dipping the tool bit in a container with a mixture of cutting oil and water. This is even more important on the softer tool bits, as excess heat will reduce the strength and ultimately the life span. For standard machining the high-speed steel tool is to be sharpened to provide large rake angles where required. Large rake angles are required, as the feed rates are much higher for poly than metals. If the rake angle is not great enough the poly will rub on the side of the tool causing the lathe to use excess horsepower to drive the spindle. Excessive heat build-up will occur causing excessive tool wear, reduction in tool life and the poly may start to melt rather than cut. Extra top rake can be introduced through grinding a channel along the cutting edge using the corner of the grinding wheel. Some operators prefer to use a thin cutting wheel (1mm thick) on a small hand grinder to grind the groove on the cutting edge. After the final shape has been achieved the cutting edges are polished using a fine oilstone to allow the Poly to flow over the surface with a minimal amount of friction and ensuring the cutting edge is as sharp as possible. This is important, as it will allow the swarf to flow away giving good visibility and longer tool life. There are some standard tool designs for turning poly, standard, tapered shoulder and straight shoulder designs. 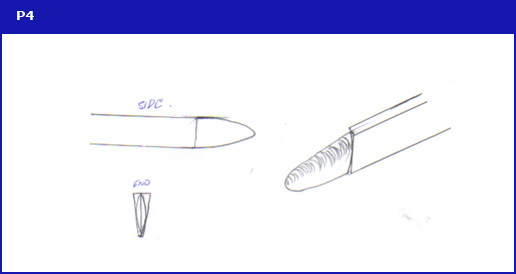 Picture P3 shows some basic tool designs that are used in turning poly. These designs can be modified to produce tooling for various turned shapes. Parting tool is to be sharpened to a knife-edge. 5.1) The finish on poly is usually quite smooth and is covered with a thin layer of mould release. This combined with the flexibility of poly can be quite dangerous if not held correctly when machining. 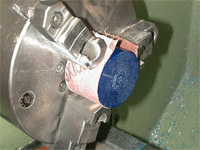 When holding in a chuck it is recommended to use a 240-grit emery cloth wrapped around the poly with the grit side against the surface of the poly. 5.3) A live centre can be used when parting off long jobs but it is not recommended for general turning as the poly is not rigid enough to not flex under normal turning loads. To drill poly it is important to use a sharp drill with a standard drill design. When drilling poly, allowances for the drill size need to be made as the hole will be smaller than the drill size and the poly will flex away from the drill. Drill speeds are lower than turning speeds to reduce chatter. To open a hole using a drill, leave the drill in the hole once it has been drilled and leave the chuck turning. The friction between the drill and the poly will cause the poly to melt and the hole will enlarge. 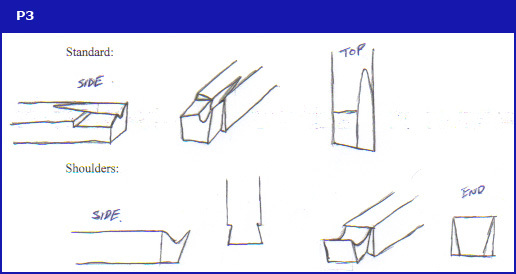 When parting off thick sections of poly a standard parting tool design can be used, but the face left will need to be trimmed as it will tend to melt as it cuts. This is a popular method when parting off a length to machine as shown in FIGÃ P7 and P8. When parting off a thin section (3mm) a modified blade is required as in FIG P4. Depending on the thickness to be parted the angle of the tool is to change. If the section to be removed is 10mm thick the blade is to be at 90 degrees to the job, but if it is only 3mm thick then the angle will be 80 to 85 degrees. This angle will change depending on the hardness of the poly and the diameter. 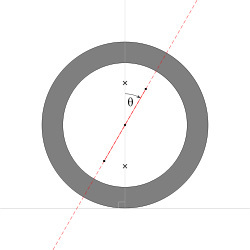 There is no exact formula for the angle of the parting tool, however it is recommended that before cutting the final job that a sample piece be parted to determine the correct angle. Mount SPROD in chuck using correct mounting procedure. Part off a length to machine, hold in chuck and drill to correct size. 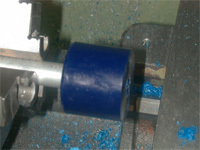 Mount on spindle and turn step to required size. De-burr with file and face head to required thickness. Final de-burr and shackle is complete. 9.1) Mount SPROD in chuck. 9.4) Plunge tool into required depth and then repeat at other end of bush. 9.5) Plunge cut out the centre. 9.6) Part to length and de-burr at the same time. 9.7) Mount on metal pin and trim both ends to length. This document is provided to give an insight to the machining of Polyurethane to qualified tradespersons only and should not be used by any person who does not have the necessary qualifications to operate the required machinery. All required safety procedures and precautions must be applied. This document has outlined some of the basic information required for machining polyurethane to produce bushings. These basic principles can be extended as required to produce any shape required. This document does not delve into milling or grinding although these too are machining operations that are able to apply to poly in order to achieve the required shapes. Just remember to apply the basic principles outlined in this document.